Fall is upon us now if you haven't noticed. Head out to the maples and see for yourself - the leaves getting mottled and starting to drop. Some telltale birds are also moving in to our area and I found one such example on the last day of summer at Saanichton Spit. I got to the spit late in the afternoon and it felt much darker than usual because it was the first day with full cloud cover in a couple weeks. I made my way out to the north-facing shoreline and could see a group of Common Mergansers (Mergus merganser) resting at the water's edge. They got nervous at my presence and pushed off into the water and I was able to see the entire group with ease. One bird stood out due to its more delicate structure, dull orange-brown head that smoothly grades into the grey of the chest and flanks, lack of a white chin, darker back, and spikier crest. It was a lone Red-breasted Merganser (Mergus serrator) in with the Commons. The bird at the back in the center is noticeably different in this group. It is a Red-breasted Merganser and its head is a dull gingery colour compared to the rich orange-brown of the dozen Common Mergansers around it, and the crest is more upswept and spikier. The first Red-breasted Mergansers return in mid-September but they are not considered common until more return in October. 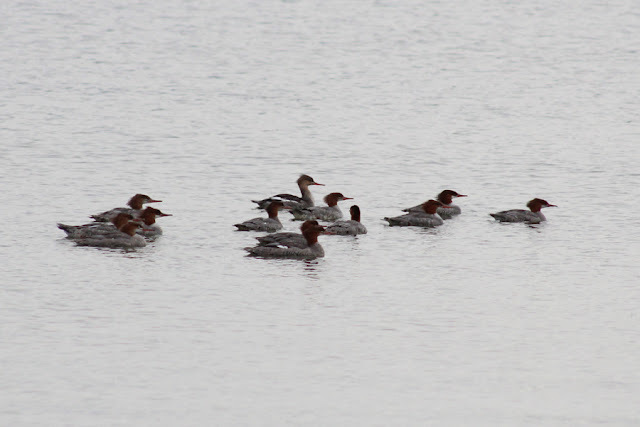 Looking at that photo a little closer, you can see the straight-lined separation of the rich orange-brown head and paler chest and grey back and flanks of the Common Mergansers compared to the smooth transition of the lone Red-breasted Merganser (far back on left). 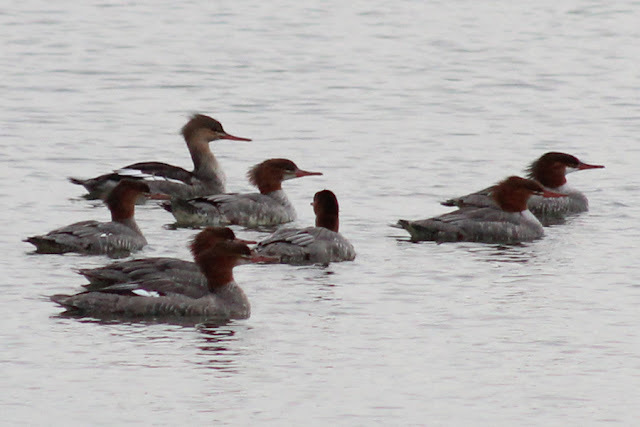 The merging of mergansers was great to see and I always enjoy seeing two related species side by side for comparison. If you struggle with these two, I hope you can see a couple differences in this photo. If not, feel free to pipe up and I'll do my best to break down the identification even further.